New German UG (Company Name and Address according to your request). Including Registration and Formation Fees in the UK and Germany. The advantage of this constellation is clearly the company does not have any problems to open a bank account or start a normal business in Germany. Other advantages are no translations, certified documents and Apostille are necessary. 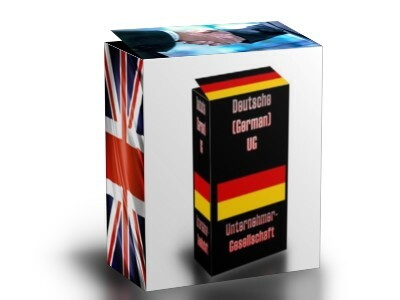 The Nominee director of the UK Limited appears at a German notary and takes the necessary steps to form the German UG. You provide the German director while the shareholder is the UK company.